We are proud to announce that our movie, "The Reflecting Pool," won the Columbine Award at the 2008 Moondance International Film Festival, in Boulder, Colorado. The October 2008 issue of Mother Jones (Special Election Edition) deals with the devastating legacy of the outgoing Bush Administration and the problems it has imposed on our democracy. A “New Hope” warms the horizon, melting away the Wicked Witch of the West (Bush, in green-face, on the cover), and so it seems the climate is finally favorable for an all-out assault on the Bush junta. One might assume that September 11th, 2001, would be an obvious point of attack. Unfortunately, Mother Jones chose instead to bash the 9/11 Truth Movement—and by extension anyone who questions the official narrative. In an article “The Truth Is Out There: In search of intelligent life in the world of 9/11 Conspiracy Theories” (p. 95), Dave Gilson states that “the 9/11 truth movement’s narrative is just as maddeningly inadequate – and unimaginative – as the neocons’.” Aside from the article being factually inaccurate, Mr. Gilson’s self-defeating thesis is astonishingly easy to dismantle – with the help of his own words. The Reflecting Pool premieres in Portland tonight (Thursday, August 7th), with filmmakers in attendance. See schedule for Portland location and further screenings. I wrote this scene into the film in anticipation of such “hit pieces” as the recent NY Times review by Nathan Lee. 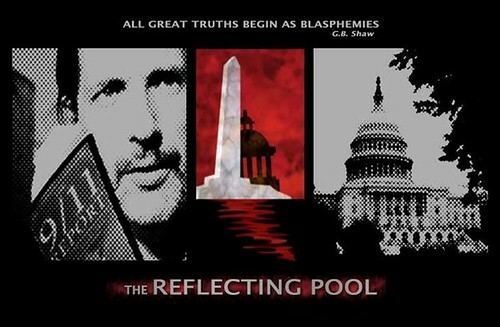 In his review of “The Reflecting Pool,” Mr. Lee states that the movie promotes “a complicit, propaganda-foisting media/industrial complex in the pocket of the Bush administration and the Jews and the oil industry!” I’m not sure which movie Mr. Lee watched, but there is not a single mention of Jews or Oil Industry in “The Reflecting Pool.” In fact, the movie doesn’t even mention Mr. Bush by name at any point. I am particularly disturbed by Mr. Lee’s injection of the Jews as culprits in the 9/11 tragedy. Which Jews is he referring to? The Ashkenazi? The Sephardic ones? The Orthodox? Perhaps the Chasidic? Such deliberate generalization is nothing but a cheap shot at discrediting my script as anti-Semitic. Had Mr. Lee paid any reasonable attention to the plot, he surely would have picked up a nice tidbit of information, which incidentally came from a Fox News source, that Israel’s Mossad issued a specific warning to the Bush Administration about the planned terrorist attacks on American soil prior to 9/11. “Special interests have blocked transition to our renewable energy future. should be tried for high crimes against humanity and nature." Able Danger and The Reflecting Pool, two separate motion pictures based on the non-official version of what happened on 9/11, will be premiering this January. The two independently made drama films confront the viewer with the facts that 9/11 could not have been perpetrated by the 19 hijackers and deal with the question who might be behind the crime of the century. Able Danger premiers Monday 28 January at the Rotterdam Film Festival in the Netherlands. The Reflecting Pool will premiere on 31 January in the Aero Theatre in Santa Monica, USA.